A review of Mariko Tamaki’s Supergirl: Being Super (DC Comics, 2018). Canadian comic writer and artist Mariko Tamaki has frequently explored coming of age and that fascinating experience of being between childhood and adulthood in comics like Skim and This One Summer. She shows an incredible ability to draw her readers into those moments in our own past where we were in that awkward state of transition between childhood and adulthood and we sought out our own identities. in Supergirl: Being Super, Tamaki unites the awkward time of questioning identity in our teen years with the figure of the superhero… another figure for whom identity and transformation are a central issue. We all remember what it was like to be a teenager and feel like we are in the wrong skin and like we don’t fit into our society… but that is magnified for Kara Danvers, a girl who just got her first pimple and exploded it all over her bathroom…. literally. Along with her friends, the young lesbian Dolly and track star Jen, Kara is seeking out what it means to be a teenager… but she is still holding back a secret from these friends. It turns out that her feeling of alienation comes from actually being an alien. Kara is from another planet. Tamaki frequently explores the idea of being an outsider and what it feels like for a teen who is treated as though she doesn’t belong… as though her entire existence is at conflict with the world around her. In Kara Danvers, Tamaki is able to explore what it means to ‘pass’, keeping an identity secret from friends, teachers, and all of those around her, what it means to worry about being a danger to everyone around her, coping with post traumatic stress, exploitation, rejection from family, and the death of a classmate… along with the desire to do something to make this world a better place. Tamaki’s Supergirl is someone who holds onto the idea of hope that people will become better even when she is constantly faced with disappointment from a human race that is still shaped by bigotry, intolerance, exploitation, and hate. Lisi Harrison’s Monster High is a series adapted from the doll brand by Mattel of the same name. Her novel adaptation, aimed at a teen rather than pre-teen audience as the dolls would suggest illustrates the adaptability of narratives around dolls and toys. Although Mattel is an American company, Harrison is Canadian. Harrison’s narrative takes a very different approach and storyline than Mattel’s other Monster High narratives such as the webbisodes and films of the same name. Yet, Harrison still explores some of the issues that are central to the rest of Mattel’s Monster High brand. Rather than setting her story in a high school just for monsters as the Mattel brand does, Harrison sets her story in a high school predominantly filled with non-monster students. Monsters are a minority in this school and in the town surrounding it and have to pass as human to avoid discovery and discrimination by the much larger non-monster population. Harrison’s narrative follows Frankie Stein, the child of other Frankensteinian creations as she navigates a society with the optimism of someone who was only created 16 days before the novel begins. Frankie believes that humans are far more accepting and open than she discovers they actually are and when she attempts to go out in public without the makeup that makes her look human, she is met with discrimination for her green skin, stitches, and neck bolts. Harrison provides a second narrator for her story, Melody, a girl whose parents reinforce certain notions of beauty through their role as plastic surgeons. In fact, Melody reluctantly had a nose job after her parents told her (falsely) that it would help her breathe better. Melody is worried that any friends she finds only like her because she now upholds the normative standards of beauty instead of looking different than the norm. She is drawn in to the world of monsters when her boyfriend turns out to be far different than what she expected. Harrison uses the two characters, Frankie and Melody – the girl who is told to fit in because she is a monster and the girl who is worried that she only fits in because she is ‘normal’ – to explore difference in an environment that is the epitome of enforced normalcy – the high school. High schools are spaces where people are policed for any difference from norms and where most kids just want to fit in, and Harrison’s Monster High exaggerates that enforced fitting in by adding the ultimate outsiders – Monsters. Harrison explores ideas of internalized isms by having Frankie constantly hide her heritage and bodily difference and instead to conform and try to blend in to her society. They force her to wear conservative clothing that allows her to blend into the background, to become unnoticed and become essentially invisible (though not as invisible as the school’s literal invisible boy Billy). Despite her attempts to conform, the school and surrounding town of Salem still has an intense fear of outsiders and even has school drills for “what to do in case there is a monster sighting” with its own special alarm system. Charles de Lint often takes his readers into the hidden parts of the world and brings attention to the things that people ignore in the world around them, whether that be the fantastic side of the world and the potential for a magical viewpoint or attention to those within our society that are often ignored such as the homeless, or those on the social fringes. In The Painted Boy, de Lint takes on gangs, a part of our society that most people prefer to ignore and pretend doesn’t exist outside of the media excitement over violent attacks (and then they are only noted at a distance). De Lint reminds readers that they do exist and that kids in gangs have a reason for being in them that can’t be gotten rid of just by punitive actions – rather, we need to look at the social issues that give rise to gangs: poverty, feelings of hopelessness, powerlessness, racism, exclusion, social ideas of masculinity, a society that celebrates violence. 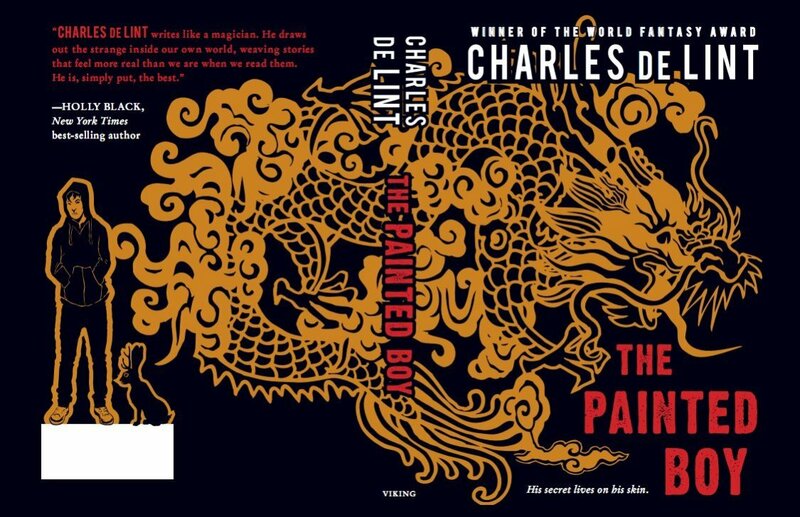 James Li is a Chinese-American teen who, at the age of 11 had a tattoo suddenly appear on his back; a tattoo of a dragon that meant that his life had changed and that the weight of traditions that he knew nothing about had come down on him. He is sent out into the world at age 17 to discover himself and find the dragon within him (literally since he is a dragon shape shifter). When he arrives in Santo del Vado Viejo, he is instantly pursued by gangs who think that he is part of a rival gang infringing on their territory. But he is the fundamental opposite of the gang mentality, though bears enough similarities to contain a social commentary on gangs. Like gang members, James Li’s body is marked with his particular group affiliation (the dragon), he has had a strict regimen of control, loyalty has been bred into him as an essential part of his being, he could be killed by those in charge if he disobeys the authorities in place, dragons are territorial so he embodies a sense of place much as gang turf does, his body contains a potential for rage and violence. But his role shows the fallacy of the claims that the gangs make. They are not actually loyal as the dragon is, they are afraid of those in control. The gang leaders will kill those under them from a sociopathic whim, whereas the dragons will only kill of one of their members becomes a threat to others. The gangs aren’t actually part of their turf, they don’t respect it or the people on it – they control it with fear. James holds a distorted mirror up to the gangs, illustrating that they are hollow and that all of the values and ideas of belonging that they claim are shallow and without substance. Gangs don’t protect or guard anything despite their claims to protect their members, where James as a dragon is the literal embodiment of protection. De Lint evokes the history of the dragon in China as a protector of emperors, but notes that over the years as empires have fallen, dragons have become guardians of places, linked to the spirit of the place and guarding over locations. They protect spaces, but aren’t lords over a territory. De Lint’s interest in place is common to many of his stories; featuring various genius loci (spirits of place) and focussing on the distinctiveness of landscapes (even urban landscapes) as having both distinctive physical but also spiritual features. By creating a figure who is a shape-shifting dragon, de Lint brings extra attention to ideas of space and place. James Li has to connect with the embodiment of the spirit of his new town in order to drive the gangs and drug lords out and protect his new home. But he also has to acknowledge the distinctiveness of his new home and learn about how to deal with the social issues that have become embedded in this place such as fear, poverty, threatening notions of masculinity, general disrespect for others, and the realities of a community in threat. De Lint doesn’t create a magical cure that fixes the society, but rather requires James to find himself within his new community and acknowledge and work on notions of changing social issues gradually. James is required to create friends, acknowledge the community around him (both human and supernatural) in order to prevent him from becoming like the previous gang leaders of the place, who weren’t really attached to it or its communities but viewed it instead as a territory to be controlled. When his dragon threatens to consume him and destroy the city he is supposed to protect, it is only through the collective efforts of the community of friends he has made getting together to have a concert and the rhythmic beat of the music that holds the collective heartbeat of the community that brings him back to himself. He learns that he cannot guard a place from a distance, but rather has to be part of it, to have connections to the people around him and to care for them. Here de Lint once again contrasts James to the gangs – whereas the gangs have a false community based on fear, James is able to establish a community based on mutual respect, cooperation and the desire for collective well-being. Key figures in this change in society are the lesser cousins – shape-shifting supernatural beings who are generally seen as weaker. Despite being self depreciating, the weaker spiritual powers are the ones who gather people together, who create connections and open pathways of communication. The Painted Boy acknowledges the importance of all members of a community in creating a society and that the under-represented often have a key role that is ignored by a society that focusses on the ‘big’ powers. Despite being one of those big powers because of his dragon heritage and supernatural abilities, James considers himself a social outsider, a kid who wants to learn and above all else wants to belong. He faces the struggle of wanting to fit in and be normal, while simultaneously wanting to be unique and special. He is in a war with himself both through his desire to lead a normal human life and his need to fulfill a destiny that has been inscribed onto him. To read more about Charles de Lint, you can visit his website at http://www.sfsite.com/charlesdelint/ and can read more about The Painted Boy at http://www.sfsite.com/charlesdelint/painted-desc01.htm .